With all of the telecommunications tools available these days, companies are better equipped to have employees working remotely. This allows them to have workers in the field, and across the globe. It also grants their workers freedom to work from home, building an environment that works better with their personal work styles. Along with this freedom, however, there often comes a disconnect between remote workers and the rest of the company. Working in close quarters with other people has a way of stimulating the bonds between coworkers, and remote employees often miss out on that. It can be difficult for these remote workers to feel like a real part of their team. To make that happen, there are a few things that leaders who work with remote team members can do. 1. Make communication as easy as possible. Regular communication is a crucial part of forming a culture, so make it as easy as you can for your remote team members to communicate with those stationed at the home office, as well as other remote workers. Hold regular meetings that include the entire team, allowing remote workers to call in. Also, adopt a collaboration application to facilitate communication between individuals and groups and make sure everyone is on the same page. It allows coworkers to hold more casual conversations and develop rapport, but also accomplish more together by collaborating constantly. Utilize other tools to keep track of employee performance in all locations. Tools like sales dashboard software gather results to a single place, allowing leaders to see a single visual representation of the team as a whole, rather than viewing local and remote results separately. 2. Make sure in-person visits happen regularly. Even though tools can simplify communication and make working with remote employees feel more natural, nothing really compares to face time. Schedule in-person check-ins with your remote team members to help alleviate the “abstract” feeling that comes with working remotely. Simply put, people form connections more easily when they’re in the same room. Encourage remote workers to attend company events whenever possible. When you schedule team-building events, fun activities, or company parties, keep your remote workers in the loop. If they’re given advance time to plan, it is more likely that they’ll be able to make it to some of these events, even if they can’t be at every meeting. Try to fly remote workers to headquarters at least once a year, and occasionally, visit remote offices yourself. Don’t turn these visits into inspections; work remotely with them yourself to allow them to get to know you as more than a voice or an email address. Company retreats can be an excellent opportunity for satellite teams and individuals to meet centrally-located coworkers as well. Sharing meals and participating in group team building activities can really help to solidify a connection between your employees. 3. Show appreciation on a regular basis. 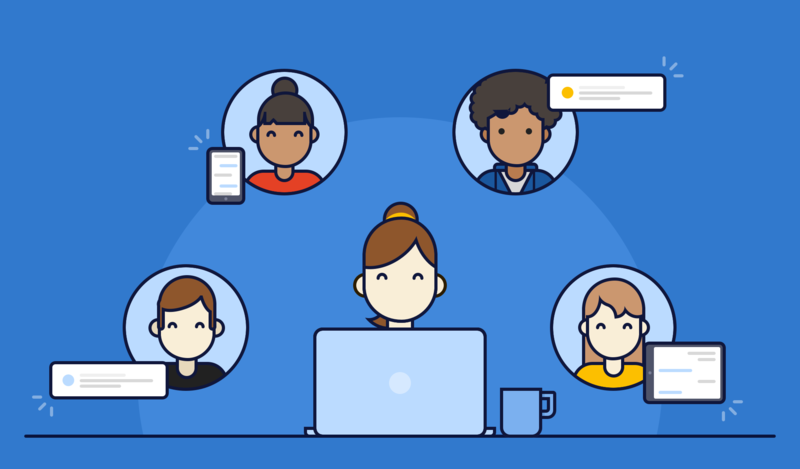 While it’s common for organizations to show appreciation to their team members, remote workers often slip through the cracks for the simple reason that they’re not visually present. Let them know when they do a good job and, just as importantly, let others know. Even something as small as a positive comment on something they say in your collaboration chat software or a simple “like” of a post a coworker makes praising them can give a boost and help them feel like part of the team. 4. Build team traditions, even when separated by distance. Recognize team members’ birthdays and work anniversaries, both to the individual and to the entire group. Build fun aspects of communication into your work process. If you’re using a team collaboration program, simple touches of humor like funny gifs can encourage participation and bonding. Treat your team members like people with interests outside of work and encourage discussion of things that are not necessarily directly linked to productivity. Jokes and traditions can help build a community. As the leader of your team or organization, your team will look to you for an example on how to behave. If you model a feeling of inclusion towards your remote workers, your team will do the same. As you engage and collaborate with your remote workers, others will do the same, and it will become a part of the overarching culture of your company. By reaching outside a specific geographic location, you can expand your business as well as the pool of talent you can draw from as you hire. By building your company’s culture to include and appreciate remote workers, your company can create new opportunities for itself that it may have overlooked otherwise. But it’s important not to unwittingly alienate your remote workers. By showing proper appreciation and putting the proper tools and policies into place, you can engage with your remote workers and build a strong team. This post is a guest post written by one of our contributors. If you'd like to write on the Azendoo blog contact us at blog[a]azendoo.com.